Storage: Eggplant can be stored for several days but is sensitive to extremely cold temperatures (below 45 degrees) for prolonged periods of time. You can store them in your refrigerator but it is best to use them within a few days of purchase. Preparation: The skin can be removed but it is not necessary. Whether peeling or not, rinse eggplant in running water and dry it with a towel; then trim off the green cap and stem and cut the eggplant as the recipe directs. To preserve texture and reduce eggplant's tendency to absorb oil during cooking, sprinkle the sliced or cubed flesh with salt and allow it to sit in a colander for 30 minutes or so. After salting, you may wish to rinse and pat dry to reduce the salt content. Contrary to popular belief, salting does not reduce the bitterness of eggplant; rather it shrivels the outer cell walls and pulls moisture from the interior, blocking absorption of oil and helping maintain firmness. Once cut eggplant will discolor quickly (if you're not salting it, sprinkle it with lemon juice to minimize discoloration). Nutritional Benefits:The iron, calcium and other minerals in eggplant supply the essential nutrients required by the body. Eggplants contain certain essential phyto nutrients which improve blood circulation and nourish the brain. But remember—these nutrients are concentrated in the skin of the eggplant, so don’t char and throw it away. 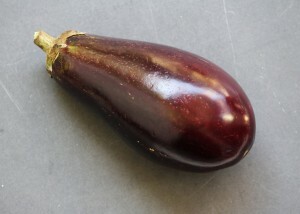 Eggplants also provide fiber, which protects the digestive tract. In fact, regular intake of eggplants can protect you from colon cancer.